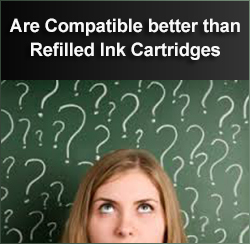 Are compatibles better than refilled ink cartridges in Galway? As an alternative to paying over-the-top prices for your ink cartridges in Galway there are generally 3 options available to printer owners. The first option is to buy a compatible ink cartridges. This is an ink cartridge made by a third-party, not the original brand manufacturer, and is in essence a ‘clone’ of the original cartridge with subtle difference ensuring that it does not infringe copyright. The second option is a remanufactured ink cartridge. This is an original brand cartridge that has been used, is now empty and has been sent back to the factory and cleaned, refilled and reset, repackaged and sold under a third-party branding. This may seem like a lot of trouble to go to but the savings on using a remanufactured cartridge can be substantial. The remanufactured cartridge differs from the compatible cartridge in that it has a built in print head in the cartridge whereas the compatible cartridges don’t have a print head, as that is located in the printer instead. Ultimately the idea behind using compatible or remanufactured cartridges is to bring down the price of a Galway ink cartridge. The third option is to have an existing cartridge refilled in an outlet that specialising in offering this service for printer ink in Galway. This service will apply to a limited amount of cartridges. It is not recommended trying to refill compatible ink cartridges, they are already low cost – it is more suited to those cartridges with integrated print heads. These are generally Lexmark, canon and HP cartridges. It is also possible to refill laser toner cartridges. It is worth checking the price of refilling an ink cartridge in Galway against the cost of buying a compatible ink cartridge. There is also the issue of the refilled cartridge being recognised by the printer and the volume level of the cartridge being registered with the printer. It is true that the same theory can apply to the compatible and remanufactured cartridges, but the cost of these if bought online should be less than refilling a cartridge. As a rule of thumb, it will be cheaper to buy a compatible ink cartridge Galway that doesn’t contain an integrated print head than an original brand or to have it refilled. When September looms and the thoughts of returning to school and how much printer ink in Galway will be bought, making a conscious decision to switch to compatible ink is something every printer owner should consider.